Former Malaysian Prime Minister Najib Razak was charged in court Wednesday local time with criminal breach of trust and corruption, two months after a multibillion-dollar graft scandal at a state investment fund led to his shock election defeat. He pleaded not guilty to all charges. "I claim trial," he said in a barely audible voice as he stood in the dock at the High Court in Kuala Lumpur. The luxury-loving Najib, wearing a suit and a red tie, appeared calm and smiled as he was escorted into the court complex packed with reporters. The judge was granted bail, set at 1 million ringgit ($325,000 Cdn). He was arrested Tuesday by anti-graft investigators over a suspicious transfer of 42 million ringgit ($13.6 million Cdn) into his bank account from SRC International, a former unit of the 1MDB state investment fund that U.S. investigators say was looted of billions by associates of Najib. In a lower court, Najib was charged with three counts of criminal breach of trust and one count of corruption. Each charge has a maximum penalty of 20 years in prison. Whipping is also a penalty but Najib would be exempt because of his age. The case against him will be transferred to the High Court where Najib is expected to make his plea Wednesday. 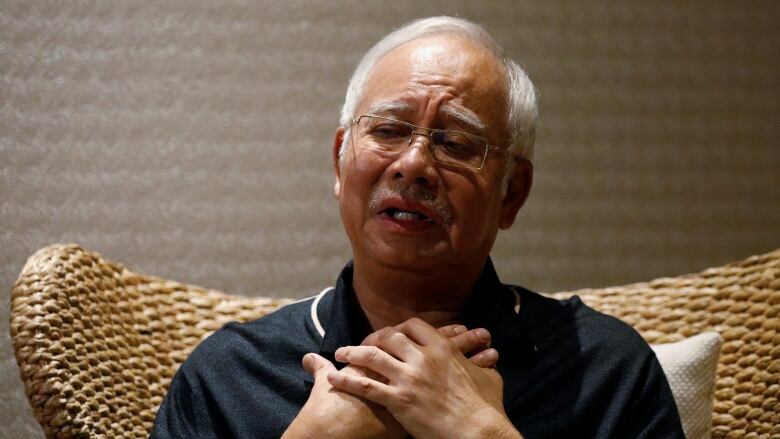 Najib's arrest comes nearly two months after his coalition's stunning rejection by voters in a May 9 general election. In a pre-recorded video posted on social media hours after his arrest, Najib apologized to Malaysians but remained defiant. "I have done my best, but I realized it is not enough. I admit there are many weaknesses … as a normal human being, I am not perfect, but believe me that the accusations against me and my family are not all true," he said. "I will face it with perseverance. Truly, Allah knows." The new government has reopened investigations into 1MDB that were stifled under Najib's rule. Najib and his wife, who have been questioned over the SRC issue by the anti-graft agency, have been barred from leaving the country. Police have also seized jewellery and valuables valued at more than 1.1 billion ringgit ($357 million) from properties linked to Najib, who has denied any wrongdoing. "This was the inevitable outcome when Najib lost the election and lost his political immunity," Bridget Welsh, a political science professor at John Cabot University in Rome, said in an email. "It shows the resolve of the new government to address previous abuses of power. It has been done judiciously so far and speaks to a needed reckoning for Malaysia and a key step toward a cleaner governance." Najib's daughter, Nooryana Najwa, praised her father as "kind, loving and gentle," and said he was emotionally and mentally strong. "Even in the face of adversary today, he smiled, laughed and gave us all a hug ... worried more for the family than himself," she wrote on Instagram. "You can paint a man black but Allah knows. Allah is not sleeping." A statement by a spokesperson for Najib, sent to the media and posted on social media, said his arrest was expected as the new government had "delivered the guilty verdict" against him in public. It slammed the charges to be made against Najib as "politically motivated and the result of political vengeance" by new Prime Minister Mahathir Mohamad. The anti-corruption agency earlier Tuesday questioned Riza Aziz, Najib's stepson and a Hollywood film producer, as it stepped up its probe on 1MDB. Riza was solemn as he arrived at the anti-graft office and didn't speak to reporters. U.S. investigators say Riza's company, Red Granite Pictures Inc., used money stolen from 1MDB to finance Hollywood films including the Martin Scorsese-directed The Wolf of Wall Street. Red Granite in March agreed to pay the U.S. government $78 million to settle claims that it benefited from the 1MDB scandal. The civil suit against Red Granite was part of an effort to recover some of the $5.9 billion that U.S. prosecutors say was stolen from 1MDB. They say hundreds of millions from 1MDB landed in Najib's bank accounts. The 1MDB government task force this week said 408 bank accounts involving funds of nearly 1.1 billion ringgit had been frozen. It said the accounts, belonging to 81 people and 55 companies, are thought to have received funds from 1MDB between 2011 and 2015.